Fig 1: "Those Days Are Passed Now, And In The Past They Must Remain..."
In yesterday’s post I talked about about how important a role comics can play in developing children’s literacy skills and engagement with reading, and how this is absolutely as true today as it was in the oft-mentioned-by-old-people Lost Golden Age of Comics, when it was all fields around here and you couldn’t swing a cat for hitting Tammys and Whizzers and Valiants left right and centre. I also outlined how there are certain problems stopping comics today from connecting with the widest possible audience of children; problems of ACCESSIBILITY and AFFORDABILITY. 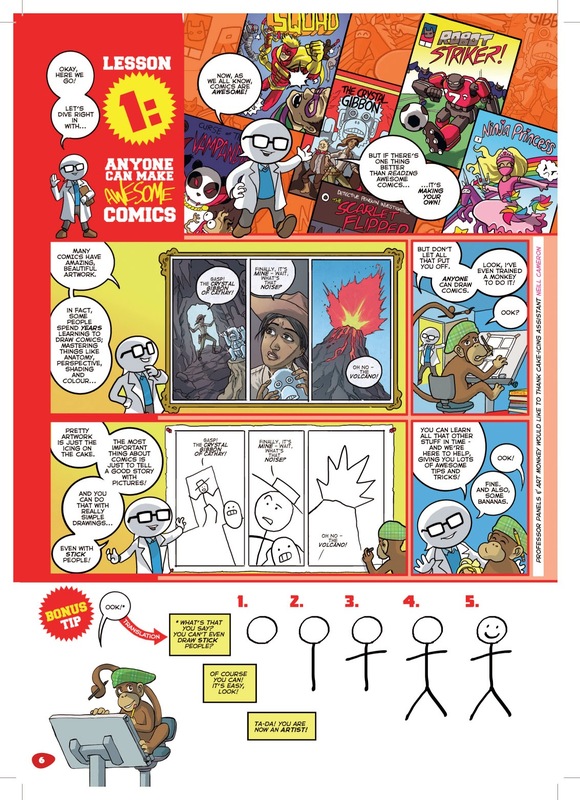 How Do We Get More Comics To More Children? There are several strands to this, several avenues - the newsstands and the supermarkets, digital distribution and the huge, centrally important role I think can be played by Good Old-Fashioned Actual Bookshops. I'm going to try and address all those things, possibly in a Supplemental to this series of posts. But for reasons of space and clarity, right now I'm going to focus on one particular solution, because it's the one I'm currently most excited about and it's one you possibly may not have previously thought of. 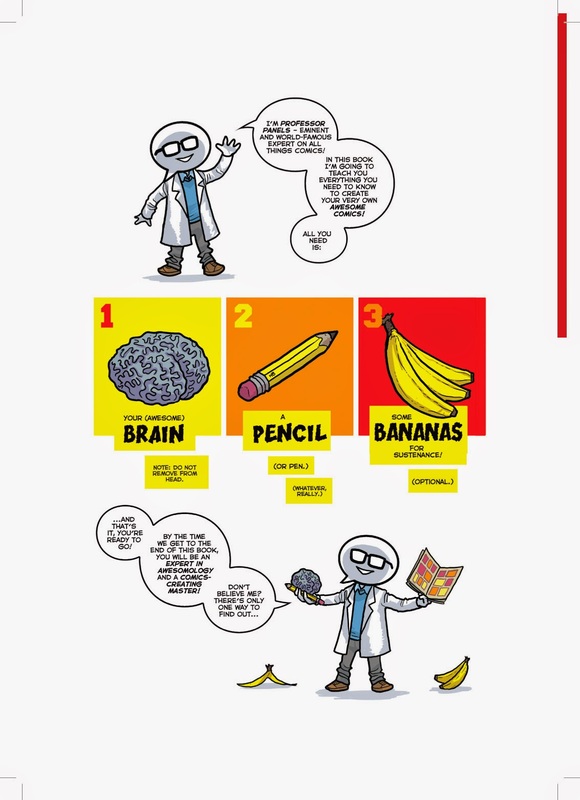 How do we get more comics to more children? 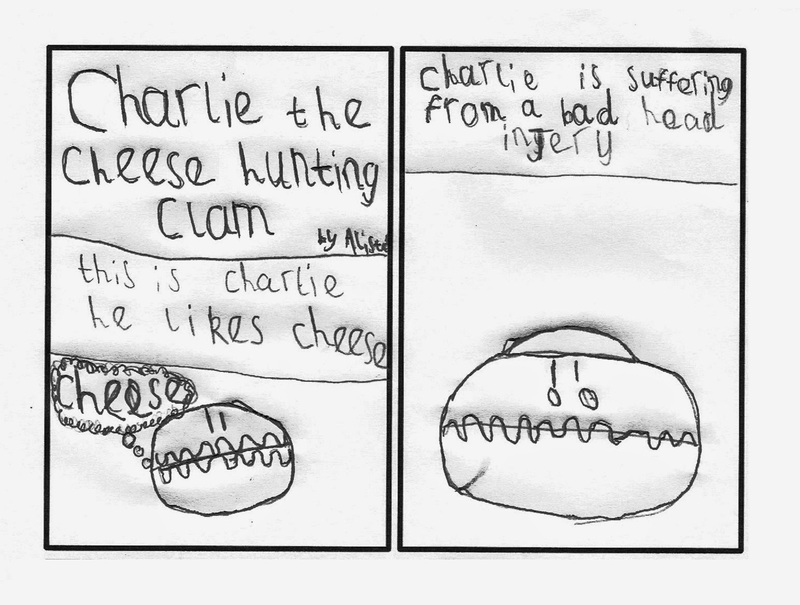 We get children making comics for each other! I’ve said this before and no doubt will again, but I genuinely believe that if there’s one thing that’s even better for developing children’s literacy than reading comics, it’s making comics. Engaging with stories, thinking up characters and jokes, learning to draw while you’re learning to write while you’re learning to read and none of it even seeming like learning because you're too busy having fun. Comics is a uniquely engageable medium at this age range - for all the reasons of ease of imitability and low barriers to entry that I've talked about before, it truly is the Have-A-Go Artform. I'm sure there are 9-year-olds out there who've composed their own sonatas and written their own novels and coded their own epic shoot-'em-ups, but for a lot of kids such prospects are going to seem hopelessly daunting. But they can have a go at drawing comics, right now. It's just DRAWING. 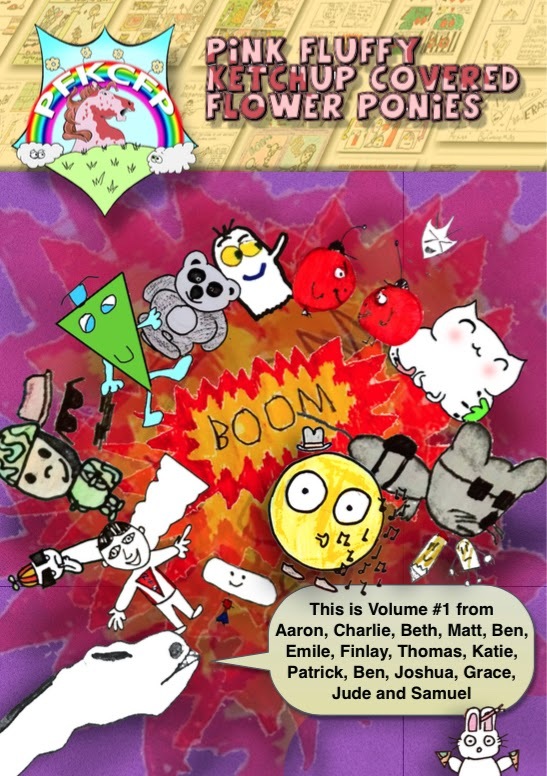 And the best part is – you get a bunch of kids making comics, you then have a bunch of new comics for other kids to read! 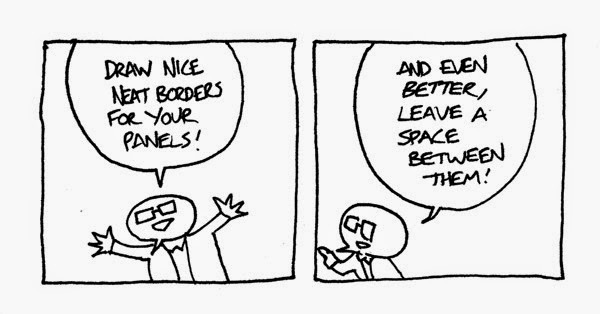 This was one of the big take-aways for me from the comics-making course I taught at the Story Museum this summer. 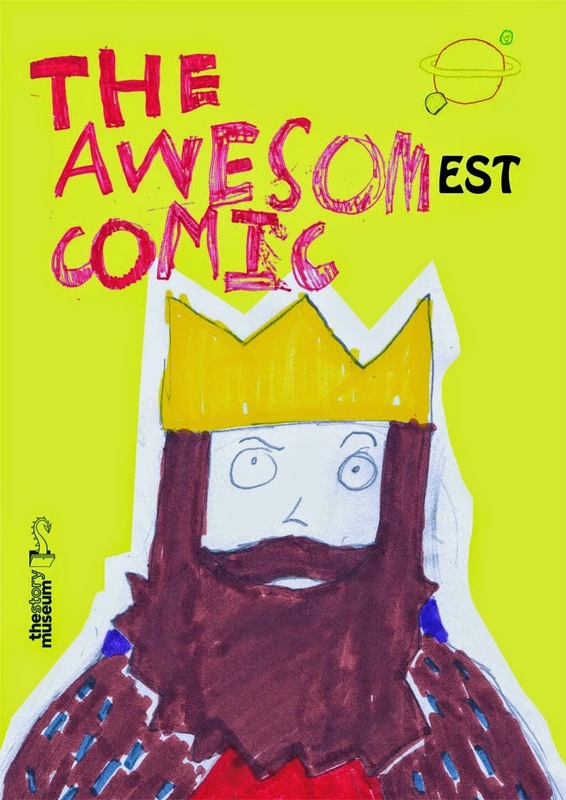 I worked with an amazing bunch of kids and helped them to make and publish an issue of their own brand-new comic, The Awesomest Comic. And, honestly, that's about it. Obviously there's a huge amount to share and learn about the art of making comics, and I'll be coming back to that later in the week, but in terms of hitting that Basic Degree of Legibility to let kids get off and running sharing their work with others, that's enough to get on with. Pink Fluffy Ketchup Covered Flower Ponies #1! 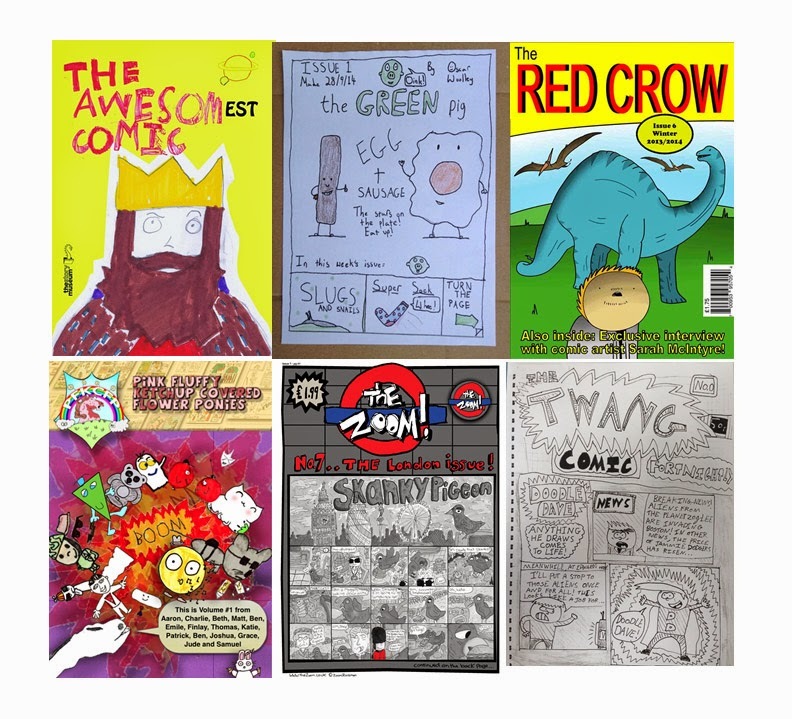 A brand new comics, to be released at Thought Bubble this November, by 15 young creators who're part of Team Ketchup - a "Children's comic review group, aged 10-15, about to embark on creating our own comics & helping people to comic jam". Isn’t that cool? Imagine if there was a club doing something like that in every school. 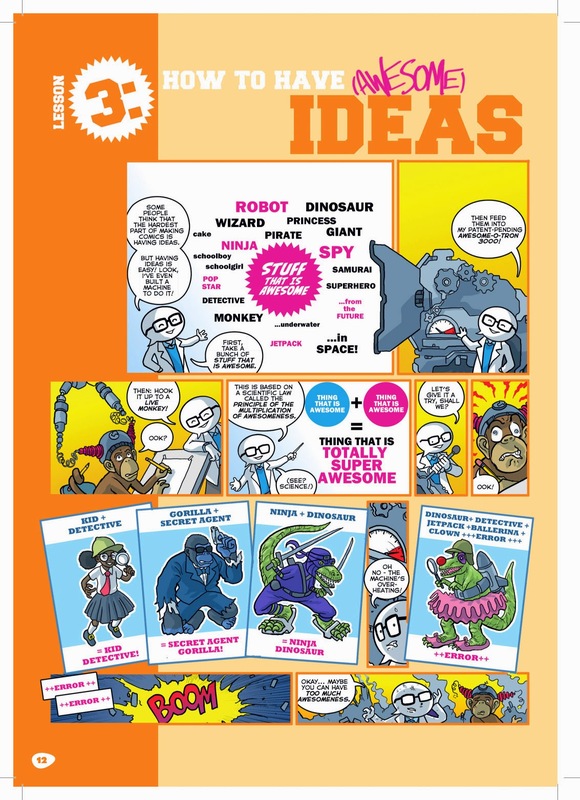 Imagine if in every school across the country, kids were being encouraged to make their own comics and then share them with their friends and with the rest of the school; to collaborate and compete and let their imaginations generally run riot. 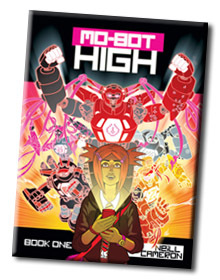 Imagine if libraries and after-school clubs and youth groups got in on the act, and imagine if there were some easy ways for all those kids making all those comics to share those comics with readers and with each other. There's your Golden Age of Children's Comics, right there. Because look. Here’s the thing. In the 1950s, the Eagle was doing 2 million copies a week. 2 million comics readers. And that - and the decades of abundance that followed, are still held up as the ideal, what we should be aiming to get back to. And I don't think we can, not in that top-down one-publisher-many-readers way, not with the newsstands the way they are now and with pricing and distribution models and all that other slightly dull stuff I talked about yesterday. So maybe we stop judging ourselves against that. Maybe we find some new and more exciting goals for ourselves, for where we are NOW. 2 million comics readers? Pfff. Whatever. You can keep it, 1950s. Let's make 2 million comics creators. Booktrust and Save The Children recently launched their Read On, Get On campaign; spreading awareness of a crisis in literacy rates, aiming at a target of every child leaving primary school to be able to read well by 2025, and calling on politicians of all parties and indeed the general public to do all they can to support this crucial goal. I – obviously – applaud this initiative, and support its aims entirely. It's prompted a lot of discussion amongst the kind of people I follow on twitter, and I wanted to try and organise here in some semi-coherent fashion my thoughts on the role comics have to play in all this. Because I think comics can be a huge part of the solution to falling literacy rates. And indeed, I think their disappearance in the last 20-30 years from their previously central space in children’s lives in this country may well be a part of the reason for that crisis. I'll kick things off in the traditional way when examining social problems: by sounding like an old man and moaning about how much better things were In My Day. (There'll only be a bit of this, I promise.) 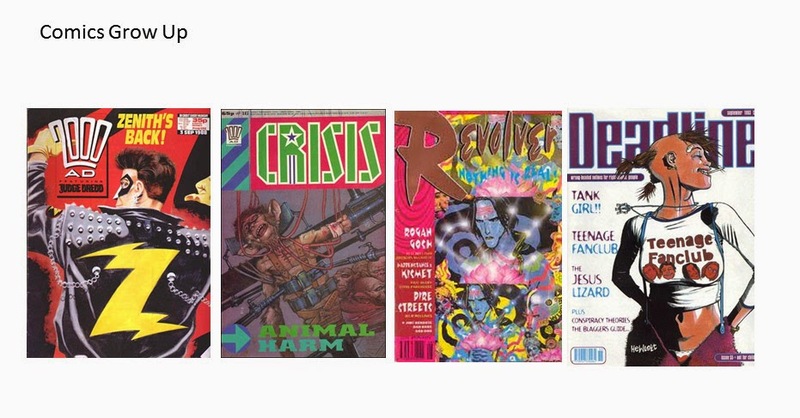 The role comics played in the childhood of many of my generation, and even more so the further you go back, was huge – and in hindsight, crucial. 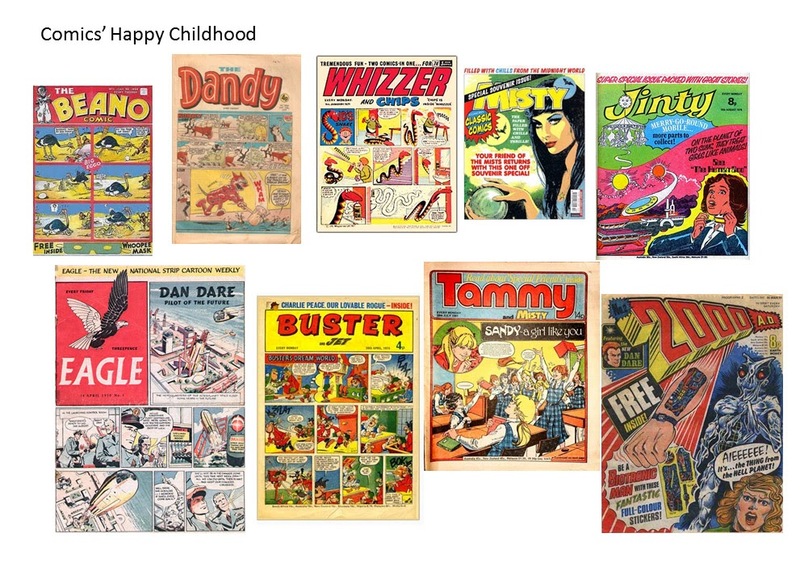 Comics were everywhere, and often free – stacks of them lying in ‘rainy day’ chests at school, at clubs, at mates’ houses, in dentist’s waiting rooms. There’d be a bunch to choose from and even if they didn’t have any of your favourites, what the heck, they were still comics right? And there was always a fresh crop to be had every week anyway, from every newsagent and corner shop in the land, at prices realistically within the realm of pocket money while still maybe even leaving enough change for a bag of Skips. RANGE. This barely needs stating, right? We all know this? There used to be a huge range of children’s comics widely available across the country, and now there is The Beano. I’m simplifying slightly, but not much. A wider range is out there, of course. 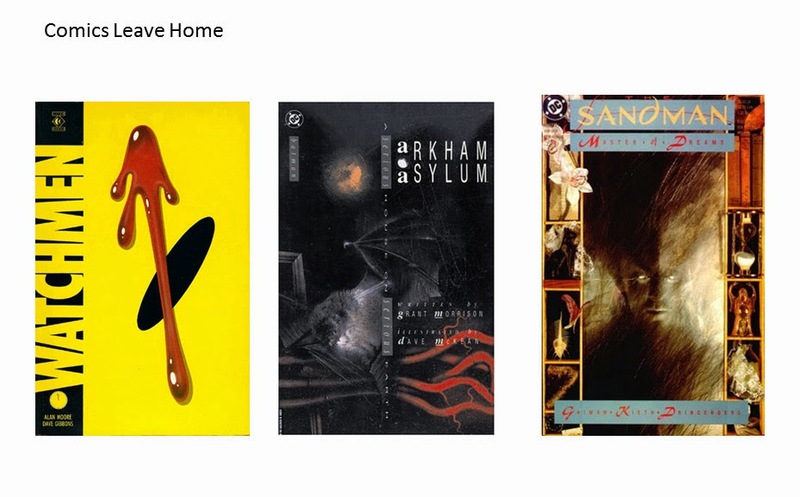 There are many, many people making genuinely great comics at the moment, but I think it is fair to say they simply are not on the cultural map of the vast majority of the population. They’re not in WH Smiths, or your corner shop, or really any place a kid is likely to be going on a weekly or more regular basis. AFFORDABILITY. Most comics, these days, are not easily within the Pocket Money Affordability Range. And there are reasons for this, sure, in terms of printing methods and rising production values and distribution models and what have you. But the end result is: comics that you are not going to be able to buy a couple of and still afford a bag of Skips. ACCESSIBILITY. Comics used to be around - very easy to encounter and get in the habit of reading, without having to particularly set out to do so. And now, by and large, they're not. They were the water in which we swam, and now they are a remote legendary spring on a mountainside somewhere. They're still there, but only for the seekers and the kids whose parents can afford nice houses up on top of the mountain. The majority, sadly, probably aren't going to make the trip. So, how did we get here? And does it matter? 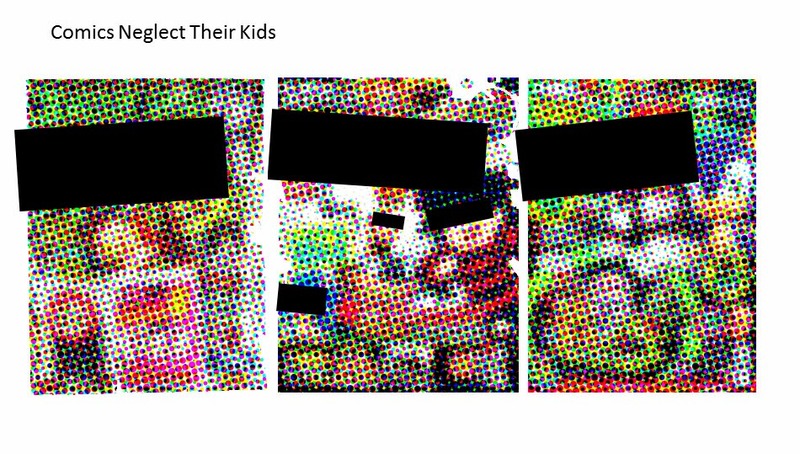 Do comics still have any relevancy to children, anyway? Haven’t we ended up in this reduced state because kids simply stopped caring about comics, moving onto video games and minecrafts and blah blah whatever we’re all supposed to be worried is ruining kids this week? Firstly, let's just demolish any hint of a pretense that 'do kids still like comics?' is even a question. I could throw any amount of anecdotal evidence at you from myself and other comics creators who work with schools and libraries and children's literary festivals, anecdotal evidence that would border on "evangelical". Or alternatively, you could just look at the extraordinary sales figures of children's comics and graphic novels in other parts of the world. Children still like comics, to the best of my knowledge, in Japan and Europe and India and every other damn place. Raina Telgemeier sells 7 gajillion copies of every new comic she makes in the US. So let's just knock that on the head. Children still like comics. They love comics, when they get a chance to actually read some. So how did we reach this point where that's no longer happening in this country? the increased focus of the remaining newsstand UK titles on expending resources and budget on the bit of plastic stuck to the front of the comic, rather than what’s inside the comic. Again, don’t want to get too negative here. Free gifts are awesome! Who doesn't like free gifts? And demonstrably, you will sell more issues of a particular comic if you stick a plastic laser gun and a bag of sweets to the front. But those free gifts aren’t really free, are they? They cost money somewhere along the line. And ultimately, if they come at the expense of making actual jokes and stories and awesome comics that engage kids' imaginations – well, yeah, maybe you’ll sell more issues of that particular comic. But I would argue that you are unlikely to make a generation of kids fall in love with reading. I was giving a talk to teachers and librarians recently on this subject and I put together a few slides as a visual aid. They're abbreviated and simplistic, and no doubt horribly unfair, but hey. It made me laugh? There we go, that was easy. But seriously, it really does. I’ve been thinking about this lately, about why we’re all doing this – those of us that make comics, and love comics, and try to spread the word of comics. Is it just because we loved them as kids, and want to see the medium continue? Because if that’s all it is, just a nostalgic self-absorbed desire to recreate our own childhoods, then frankly we should just call the whole thing off and all go home and eat a bag of Skips. It’d be cheaper and just much less hassle all round. But it’s not that. Comics matter, for all the reasons that reading matters. Learning to read makes a tangible, measurable difference to children’s lives and prospects, in terms of economic outcomes and quality of life. 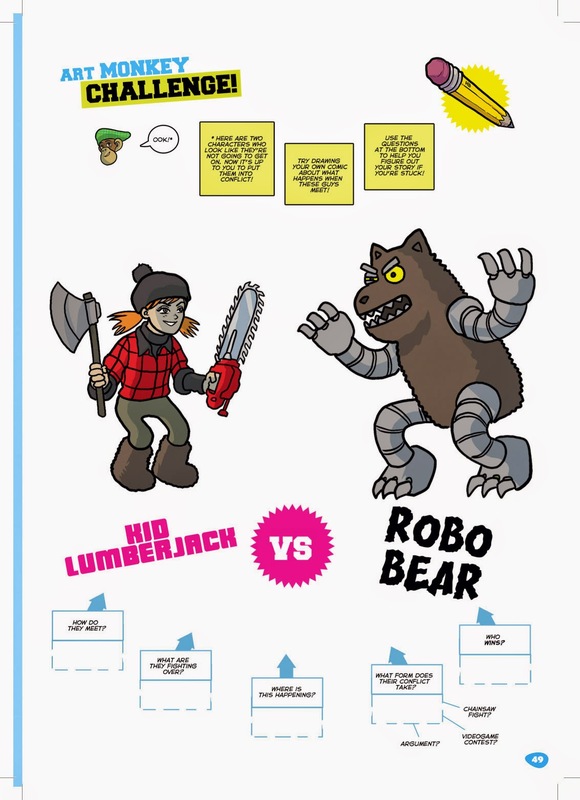 And comics are – have been, can be, will be again – a huge part of learning to read. Of reading for pleasure; of coming to love reading; making it not something that is enforced from above, a Discipline That Must Be Mastered, but something so exciting and cool and mind-blowingly awesome that it has to be torn out of kids’ hands when it’s time to go to bed. offering unique opportunities for exciting subject matter that can hook kids imaginations, lending itself to strong visuals. Robots! Dinosaurs! Mutant rabbits with laser nunchuks! COMICS. When kids actually get to see comics, when they are given exciting stories and phenomenal artwork and funny jokes about beavers doing a radioactive poo, they flip out. They dive in with both feet and get lost and fall for comics so hard that it alternately makes me inspired and delighted and, actually, angry. 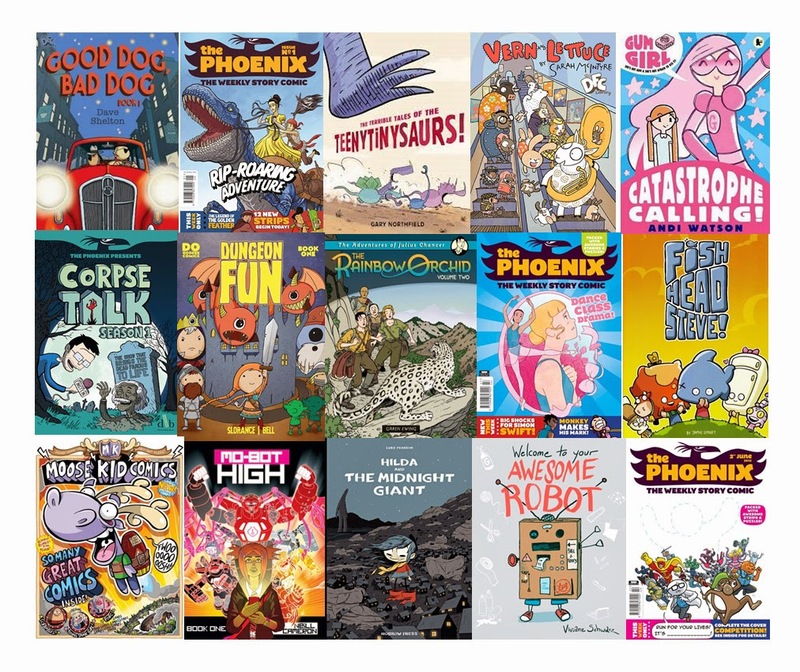 Angry because I’ve seen, first hand and over and over again, just how much enjoyment and hilarity and genuine learning and TANGIBLE INCREASES IN READING DEVELOPMENT kids get from comics like Corpse Talk, or Dungeon Fun, or Moose Kid, or Star Cat. And because I know, all too well, that those comics are not a part of the lives of the vast majority of children, right now. They’re not in the corner shop, they’re not in big rainy day trunks at school, they’re not in the dentist’s waiting room. They are, to generalise wildly, the province of a privileged few: those with parents who can afford them and have even heard of them in the first place. All of which immediately limits your reach down dramatically to a pretty small circle of ‘in the know’ people. And whilst I love those people to bits and indeed am one of them, I think we can all agree it’s not enough. We need to break past that circle, to explode the art form outwards and back to where it should be; an available, accessible, affordable part of the lives of all children. I'll be posting more on this subject every day this week, including some actual ideas and concrete proposals on how we actually, y'know, DO that. 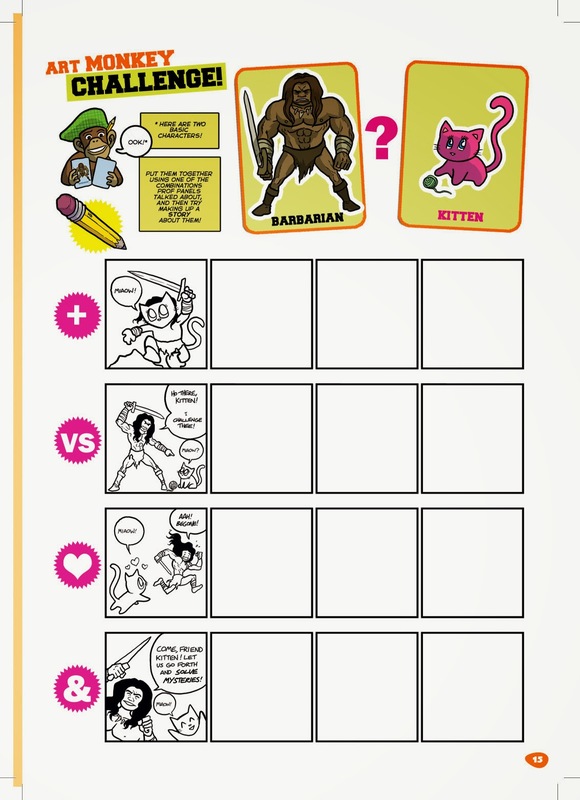 But first, tomorrow: the BEST way comics can help develop children's literacy, which I haven't even mentioned yet. I thought I'd post a few pages of How To Make Awesome Comics here, to give people a taste of the book, and talk a little bit about the thinking that went into it. 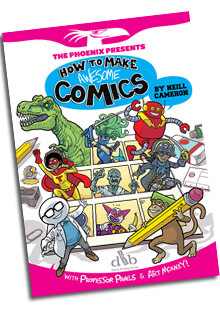 It's broken into six chapters (plus appendices), the idea being to give a complete step-by-step introduction to all aspects of the comics-making process, in a way that is hopefully approachable, non-terrifying and entirely non-"THIS is how you have to do it!" Chapter One contains some introductory lessons to warm up and, y'know, BREAK DOWN RESISTANCE. The general message being - have a go! Do it. The lesson I always try to get across in workshops is: don't worry if you think you can't draw, or if some unhelpful person's told you you're no good at it. If you can draw a stick figure, you can draw comics. FACT. Chapter Two dives right into the fun part, the Coming-Up-With-Ideas part; again, this is all based on what I do in workshops, giving kids just some really easy starting points for stories, to rule out that initial "but I haven't got any ideaaas" reluctance you often find. 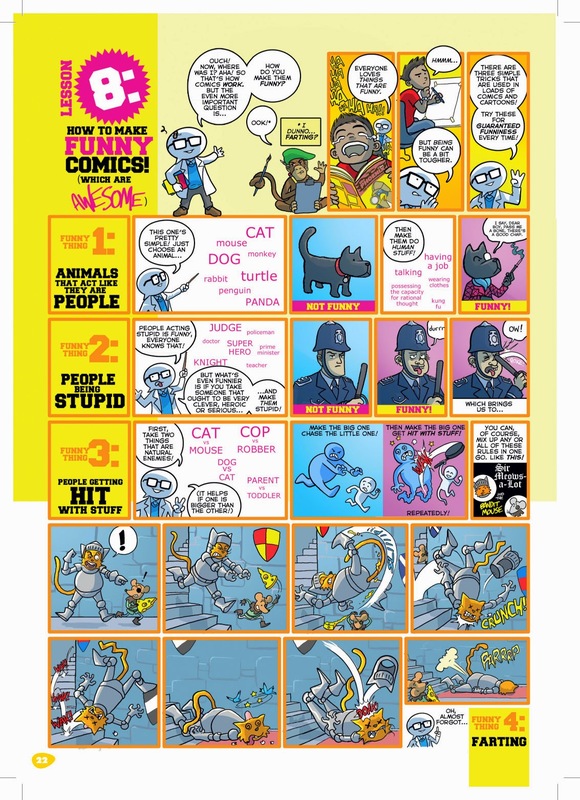 Chapter Three gets into a little bit of Comics Theory, covering how the basics of how comics work as well as the slightly wider question of What Is Funny, Anyway? 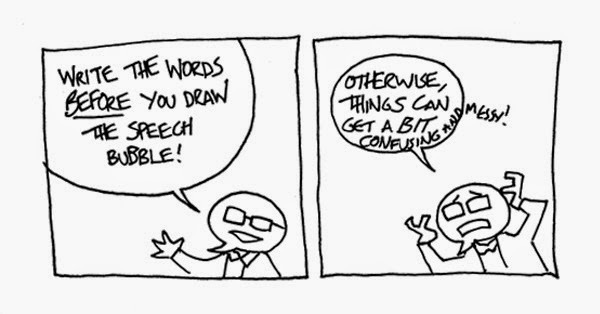 It's kind of my abbreviated take on both Scott McCloud's Understanding Comics and Aristotle's Poetics - did that sound pompous enough, or should I go on? There are fart jokes. 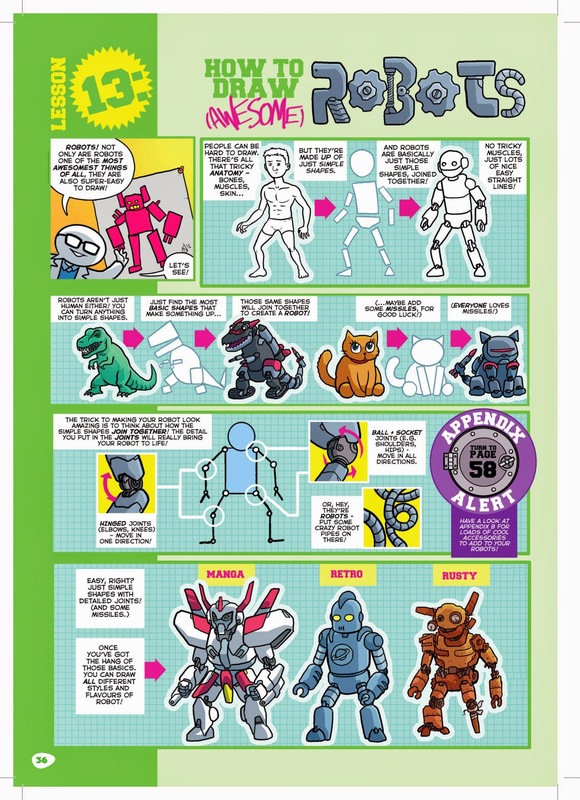 Chapter Four then goes into the actual How To Draw stuff, using lessons on drawing Robots, Pirates, Dinosaurs and suchlike to (again, hopefully) communicate some of the fundamentals of figure construction and cartooning. Chapter Five gets into the real nuts-and-bolts of storytelling, how stories work, all that jazz. I started doing this kind of stuff partly as a kind of parody of the absurd reductiveness of all those 'How Stories Work' manuals, from Robert McKee to Joseph Campbell to, I guess, Aristotle again. But I've genuinely found - and again, it's all from doing workshops - that giving kids this tight basic framework of obviously-kind-of-ridiculous rules to push against is a great way of getting them over those initial hurdles and to the point of having created and finished something. 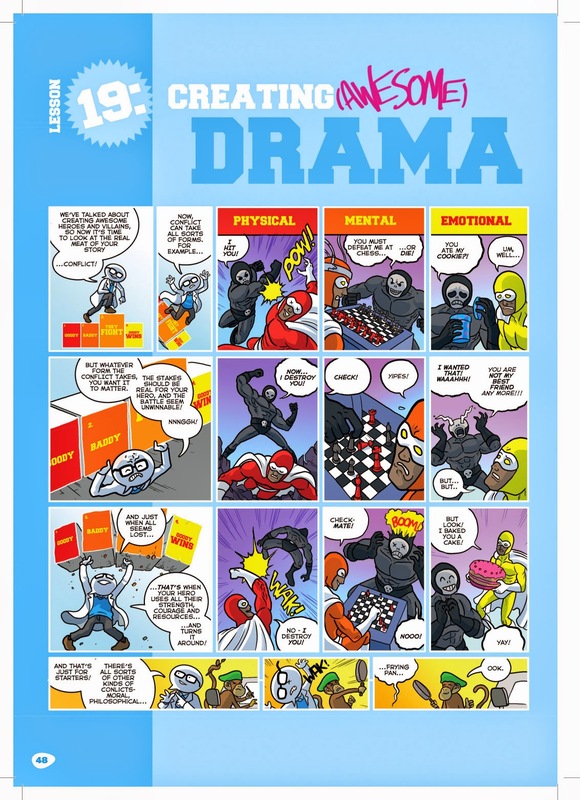 Chapter Six pulls it all together and is basically an attempt to convince readers how easy it is, nowadays, to actually put something out; to collate and print and publish your own comic. And how fun that can be. 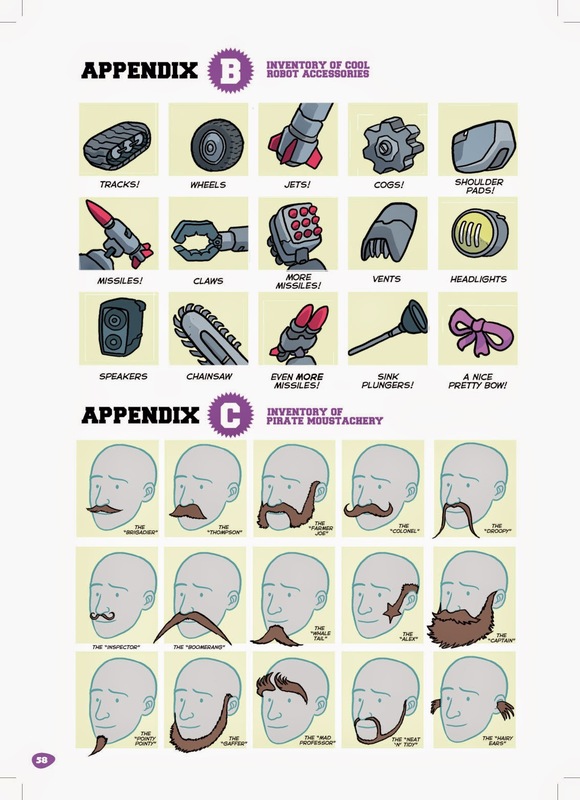 And then you have a bunch of appendices that teach you the really important stuff like how to draw different moustaches, and missile launchers, and that. Just to reiterate - for parents / teachers / anyone who simply prefers not to scribble all over their nice new book (which apparently is some people) all the exercises / Art Monkey Challenges from the book are available to download and print off from the Phoenix website - along with a whole bunch more, besides. 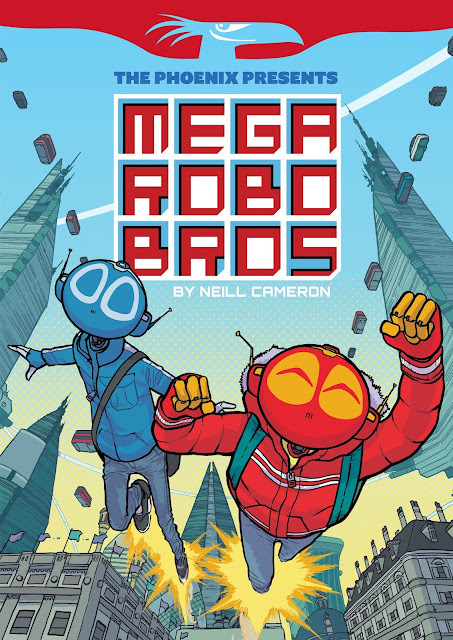 I've seen some lovely reviews of the book here and there, but really the best part so far is hearing from parents who've got in touch and said that their kids have read it and just gone nuts for making their own comics. That's really the best review I could hope for, right there.